WELLY walks in frozen leaves and staying in by the fire are among Brits’ favourite things about winter. 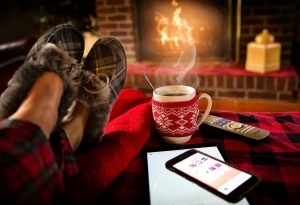 A new study found that a large percentage of us love associating the colder weather with long soaks in hot bubble baths, digging out winter boots, taking time off work, outdoor ice rinks and the smell of a Sunday roast. However, the Love Fresh Berries research revealed three in 10 Brits loathe the cold season due to getting up for work in the dark, constantly feeling ill and suffering from dry skin. It also emerged 85 per cent of adults are more likely to comfort eat during winter. Sophie Medlin, registered Dietitian and Love Fresh Berries spokeswoman, said: “Most people find that when it is cold and dark outside, they are more likely to reach for foods that offer easy energy. One in three Brits hate having to defrost and scrape ice off their car windscreens in the freezing mornings. And four in 10 Brits admit doing less exercise than in summer. And half of the 2,000 respondents often need a ‘pick-me-up’ to get themselves out of a low winter mood, according to the research. Berries are a great source of vitamin C which has been shown to shorten the length of a cold.